What foods will I be able to eat? You can eat almost any food without damaging your appliances; however, special care must be taken. We ask you to avoid hard, chewy, sticky foods because they are likely to loosen brackets and bend arch wires. Following these guidelines will help minimize your need for repairs. Raw fruits and vegetables and chewy breads and pizza crust need to be cut into small pieces and chewed with your back teeth. High sugar content foods such as candy, cakes, cookies, soft drinks, etc. should be avoided or limited, as these foods tend to promote decay. If you eat these foods brush your teeth or rinse your mouth out with water right away. If you have a loose bracket call the office to schedule a repair appointment as soon as possible. Repairs are done in the morning because they are more time consuming than regular appointments. If loose brackets are not taken care of in a timely manner there is risk of prolonging treatment. If the loose bracket is still attached to the wire please leave it. If the bracket is bothering you, put wax on it so it does not irritate your lips or gums. If the bracket comes off, please save it and bring it in with you to your next appointment. What happens if I have trouble with my wires? Wire out of a molar tube - Try to place wire back into the tube using tweezers. Place wax over wire. Rotated arch wire -Try to slide the wire back around to the other side. If unsuccessful, place wax on wire. Poking wire - Cover with wax or cotton. Broken wire - Remove the broken portion of the wire if possible. Place wax over the exposed end. Why are my teeth hurting? 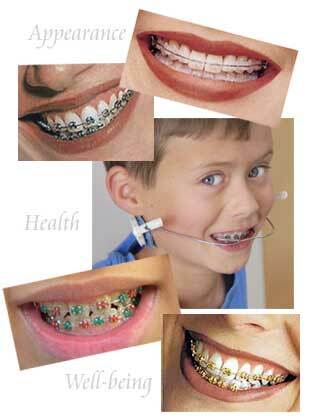 After you have your braces placed you may feel discomfort later that evening or the next morning. This discomfort will usually last for 3-4 days and is a result of your teeth moving. Take whatever pain reliever you normally take and eat softer foods in the mean time. When you come in for your monthly activation we will let you know what changes to expect for the upcoming month. Congratulations on getting your braces! You are now on your way to having a bright new smile and improved bite. The following information will help answer any questions you may have during your orthodontic treatment. Floss your teeth at least once daily. This should be done before going to bed at night and will take about 10 to 15 minutes to complete. Flossing at night will enable you to do a more thorough job because you have more time to do so. It is very important to remove all food and plaque that has been caught in your teeth and braces throughout the day. We provide you with a packet of floss threaders and floss to get you started. Additional quantities can be purchased at local stores. Brush your teeth after each time you eat. This will be no less than 4 times each day. Brush after eating breakfast, lunch and dinner and before going to bed. If it is not possible to brush immediately after eating, brush your teeth as soon as the opportunity allows. Brush for no less then 2 minutes each time making sure that all areas of your teeth and braces are clean. Pay particular attention to the area around each bracket and close to the gum tissue as these are often missed. Use a mirror as often as possible; it will help you see areas you may be missing. Also, brushing your tongue, which will aid with fresh breath. Prevident is the prescription strength fluoride toothpaste which we recommend you use twice a day. Use a pea-sized amount of Prevident in the morning and before bed in place of your regular toothpaste. Do not eat or drink for 30 minutes after brushing with Prevident. The fluoride will protect the surface enamel of your teeth and help prevent cavities and decalcification (white spots). Prevident is available at our office or by prescription from Dr. Wong. We also recommend MI Paste, a calcium bolstered, milk based product that helps rematerialize enamel. It is imperative that you maintain regular check-ups and cleaning appointments with your general dentist. Cleanings should occur at least every 6 months during orthodontic treatment. If you need help, please ask. Our team is always willing to lend a hand.